A project template is a customized starting state for a project. It can include maps, scenes, layouts, databases, folder connections, and other items. Any configuration of a project that you want to reuse can be saved as a project template. One reason to create project templates is to standardize practices within a workgroup or organization. For example, you can ensure that maps, scenes, and layouts have a consistent appearance, use the same datasets, and apply the same symbology. Another reason is to tailor the user interface for specific user roles. For example, you can make sure that a new project contains toolboxes with tools needed for certain tasks or that certain databases or folder connections are included. Project templates are based on existing projects. You'll open a project containing a map and scene zoomed to New Zealand and share this project as a project template. At the top of the dialog box, in the Search box, type Create a project template tutorial and press Enter. In the list of search results, click Create a project template to select the project package. The project opens with a 2D map and a 3D scene. 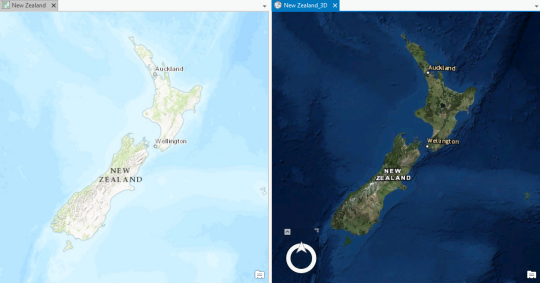 Both are zoomed to New Zealand. On the ribbon, click the Map tab if necessary. In the Navigate group, click Bookmarks and confirm that your project has four bookmarks. Saved properties and settings of your project—including the map, scene, and bookmarks—will be included in the project template. In the Catalog pane, make sure the Project tab is selected. Browse to Databases > create_a_project_template.gdb. The project geodatabase contains three feature classes: Highways, Populated_Places, and Regions. These datasets will also be included in the project template. A project template can be shared to your ArcGIS Online or ArcGIS Enterprise portal or it can be saved locally. In this tutorial, you'll share the template to your portal to make it easily available. If you don't have Internet access or sharing privileges to your portal, you can save the project template locally. You won't be able to complete the tutorial steps exactly as written, but you will be able to access the template to create a project. In the upper right corner of the ArcGIS Pro window, confirm that you are signed in to your ArcGIS Online or ArcGIS Enterprise portal. On the ribbon, click the Share tab. In the Save As group, click Project Template . The Create Project Template pane appears. Under Start Creating, accept the default option to Upload template to Online account. Under Item Details, in the Name box, replace the default name with New_Zealand_template. Add your name or initials to the name. This makes your template easy to recognize if other people in your organization create a project template with the same name. 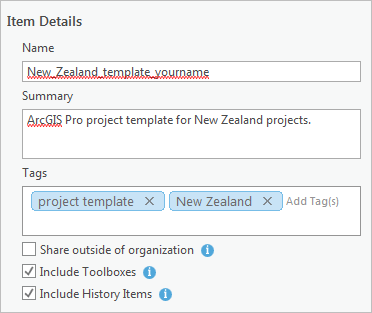 In the Summary box, type ArcGIS Pro project template for New Zealand projects. In the Tags box, type the following keywords: project template, New Zealand. (Make sure the two tags are separated by a comma.) Press Enter. If spell-checking is enabled on the settings page (as it is by default), unrecognized words will be marked with wavy underlines. See Proofing options for more information. Optionally, under Location, click the Folder drop-down arrow and choose a folder for the project template in your portal account. You will only see folders in the drop-down list if you have created them in your portal account. Under Share with, check the box next to the name of your ArcGIS Online or ArcGIS Enterprise organization. The name of your organization is displayed, not the literal text Organization Name. If all the Share with options are unavailable, this means that you don't have sharing privileges in your ArcGIS Online or ArcGIS Enterprise account. To continue with the tutorial, at the top of the pane, under Start Creating, click Save template to file. For more information about sharing privileges, see User types, roles, and privileges in the ArcGIS Online help. At the bottom of the pane, click Analyze. A message informs you that there are no errors or warnings. Click Create. If you are prompted with a Save Project message, click Yes. It takes a few moments for the project template to be packaged and uploaded to your portal. At the bottom of the Create Project Template pane, a message confirms that the project template was successfully created. The message includes a link to manage the package. The template has been shared to your ArcGIS Online or ArcGIS Enterprise portal. You'll open its item details page in your portal and add metadata to the template. The instructions and images in this section apply to an ArcGIS Online portal. If you have an ArcGIS Enterprise portal, your user interface may be slightly different. If you have trouble adapting the instructions, you can skip to the next section. In the message at the bottom of the Create Project Template pane, click the Manage the package link. A web browser opens to the ArcGIS Sign In page. Sign in to your portal with your user name and password. To the right of Description, click Edit. In the Edit Description box, type or copy and paste the following text: ArcGIS Pro project template for use with New Zealand-based projects. Includes a topographic map and an imagery scene zoomed to New Zealand. The project geodatabase includes three datasets. Under the text box, click Save. Now you can use the template to create a project. In ArcGIS Pro, on the ribbon, click the Project tab. In the list of tabs on the left, click New. Alternatively, you can start a second ArcGIS Pro session. If you do that, on the start page, under Recent Templates, click Select another project template to open the Create New Project From Template dialog box. Continue with step 4, below. On the New project page, under New, click Portal and expand My Content. Project templates have the file extension .aptx. The New Zealand project template is listed under My Content. Although you can access the template from this location, other users need to browse to it because they do not own the item. You'll test the workflow as it would be for a different member of your organization. If you saved the template locally, click Computer instead of Portal and expand Documents to access the project template. At the bottom of the page, click Select another project template. On the Create New Project From Template dialog box, on the left, click All Portal. Under the search box, click the Search My Organization button . This restricts the search to items in your organization, as opposed to all items shared publicly to ArcGIS Online. In the search box at the top of the dialog box, type New Zealand template and press Enter. The template appears in the search results. Click New_Zealand_template_yourname and click OK. The New Zealand Test project, based on the template, opens. It has the same map and scene as the template. On the ribbon, click the Map tab. In the Navigate group, click Bookmarks . The new project includes the four bookmarks from the template. In the Catalog pane, on the Project tab, expand the Databases folder. The project has two geodatabases: the New Zealand Test project geodatabase, which is empty, and the create_a_project_template geodatabase, which contains the Highways, Populated_Places, and Regions feature classes. All new projects created from the template will look the same. A number of templates are included with ArcGIS Pro. The start page has templates to start a project with a map, the catalog view, a global scene, or a local scene. You can also start without a template, which allows you to work without saving a project. The template you created in this tutorial will appear in your list of recent templates on the start page. It will also appear in the ArcGIS Pro settings, on the New page, on the Recent tab. 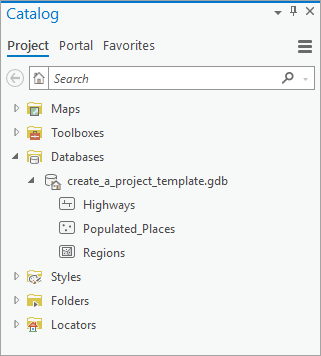 Additional templates can be found in the ArcGIS Pro settings, on the New page, on the Portal tab, under Esri Project Templates.